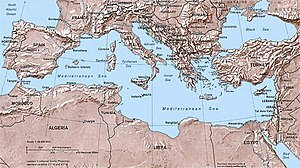 The Mediterranean Sea (or Mediterranean Sie) is the wattir that sinders Europe, Africae an Asie. The Mediterranean Sea is a pairt o the Atlantic Ocean awmaist hailie surroond'd bi laund, on the north bi Europe, on the sooth bi Africae, an on the eist bi Asie. It kivers aboot 2.5 million km² (965 000 mi²). The name Mediterranean meins "in the mids o the laund". Wikimedia Commons haes media relatit tae Mediterranean Sea. This page wis last eeditit on 9 Februar 2018, at 05:52.